1. MATERIAL: Corrosion resistant steel, Type A286 (UNS S66286) in accordance with AMS3525, AMS5732 or AMS5737. 2. FINISH: Only 800°F nuts: silver plate all threaded surfaces of nut element in accordance with AMS 2410. Threads shall show complete coverage. Silver plating on all other surfaces optional. Tarnishing or discoloration of silver not cause for rejection. 3. LUBRICANT: Only 450°F nuts: dry film lubricant in accordance with MIL-N-25027. 9. PERFORMANCE: See specification, except 450°F dry film lubricated nuts limited to five cycles. 10. 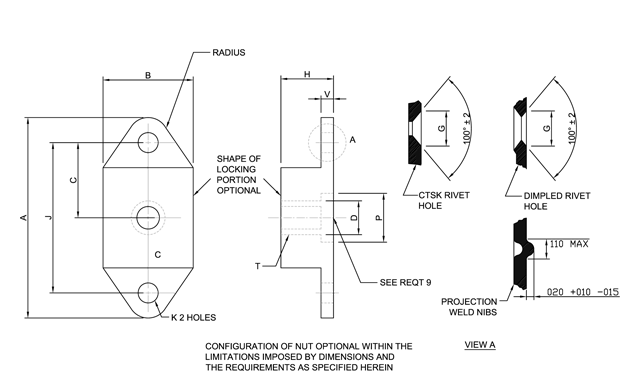 FLOAT OF NUT PORTION: Float of nut portion of assembly shall not be less than .030 radially from centered position. 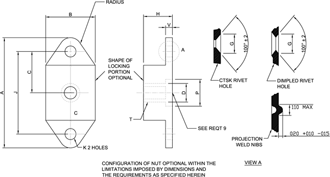 Nut element shall be capable of engagement with bolt in the maximum misaligned position. MS21060 nuts can universally replace NAS686 and NAS1031 nuts of like material, thread size lubricant (dry film or silver plate) rivet spacing and fastening method (plain rivet holes dimpled or countersunk rivet holes or Projection welding), but these NAS686 and NAS1031 nuts cannot universally replace MS21060 nuts.